Collect some aloe plants for the Root-Whisper tribe healers. The healers of Root-Whisper Village are in need of a rare aloe that goes [sic] in Vakka-Bok. I'll need to make my way past the dangerous creatures that lurk there in order to gather this plant. Speak to Tuwul in the Root-Whisper Village. 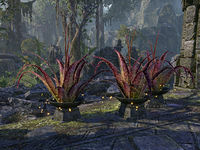 Head into Vakka-Bok Xanmeer and gather three aloe plants. Return to Tuwul for your reward. I should head into Vakka-Bok Xanmeer and collect the aloe. Finishes quest I've collected the aloe. I should travel back to Tuwul in Root-Whisper Village in order to collect my reward. This page was last modified on 17 January 2019, at 07:00.